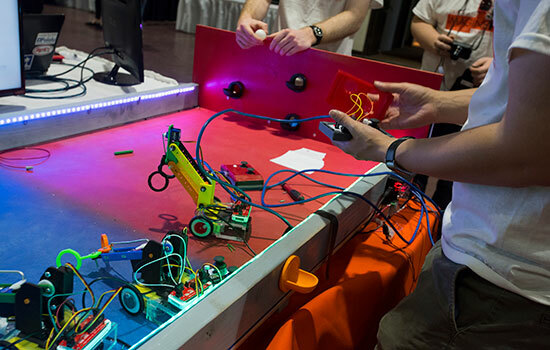 “I’m a freshman,” replied Goossen, a biotechnology and molecular bioscience major from Chili, N.Y.
Goossen was among hundreds of RIT students behind a record 438 exhibits at the 2018 Imagine RIT: Innovation and Creativity Festival. 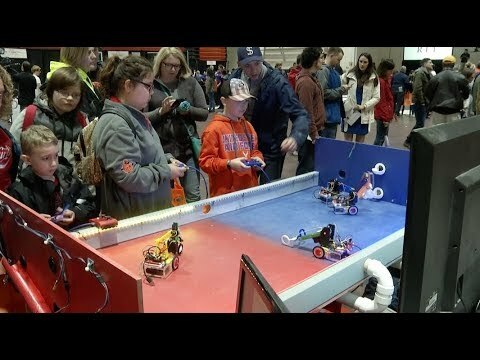 The day-long festival, now in its 11th year, showcases student innovation in science, technology, engineering, the arts and mathematics and draws tens of thousands of visitors to the Henrietta campus. Diversity was also on display, with several international student groups showcasing their food, historical contributions, music and more. In the Mobius Quad, the Latin Rhythm Dance Club performed salsa, bachata and merengue dances; at the MOSAIC Center, festivalgoers got their names written with Chinese calligraphy in celebration of Asian Pacific Heritage Month; and in the Global Village Quad, students from Saudi Arabia performed dances and showcased inventions from Saudi Arabia that dated back centuries to modern marvels such as the world’s largest clock in Mecca. RIT’s National Technical Institute for the Deaf featured several exhibits focusing on connecting the deaf community. One project is a media and entertainment company specializing in delivering media content to the deaf community, while another uses computer vision and machine-learning algorithms to translate American Sign Language into English text to help bridge the gap between deaf and hearing people. One exhibit, Small World That, is an app and website designed to be a central hub for the international deaf community. Through the platform, users will be able to locate and connect with other deaf and hard-of-hearing people around the world. Sarah Stanislow, an international and global studies major from Pittsford, N.Y., travels often and is anxious to get the app into the hands of users. Small World That won first place Wednesday at NTID’s Next Big Idea student entrepreneurship competition. The app is in beta test mode and will be launched this fall. Part of the festival’s focus is to showcase RIT’s unique positioning as a university working at the intersection of technology, the arts and design. 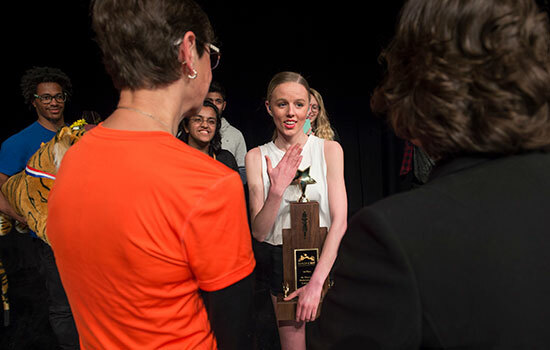 New this year was President Munson’s Performing Arts Challenge, which kicked off the event. On Friday evening in Ingle Auditorium, a panel of judges watched 10 acts that had been chosen as finalists for the competition. The top three winners received trophies and large stuffed tigers wearing medals. Munson said he was impressed, but not surprised, by the talent displayed. He said the competition represented only a fraction of talented students on campus because established performing arts groups as a whole were ineligible for the competition. The arts continued to shine Saturday in “Artistic Alley, ” with the College of Imaging Arts and Sciences featuring everything from simulated passenger experiences inside an autonomous vehicle, 3D digital design senior thesis presentations and virtual arcades to face painting, hot glass demonstrations and open figure drawing. A steady crowd of visitors to the Resonate exhibit inside Booth Hall was bringing out its inner DJ as people twisted, stepped and moved around the room to flashing video and electronic music. Ulijah Charles, a fourth-year new media interactive development major from Brooklyn, N.Y., said the exhibit’s goal was to help festivalgoers learn about music synthesis in a fun and educational way so all users could contribute to a collective audio experience. Alumnus James Paulius ’13 (industrial design) lives in Brooklyn working as a freelance industrial designer and returned to campus to showcase Blockitecture, architectural building blocks he designed when he was a student participating in Metaproject 03. His exhibit in the Wallace Library aimed to pull back the curtains on the design process. “They can see the evolution from the first prototypes where I really had no idea what I was going to make and evolving it into something definite and a concept like Blockitecture,” he said. Lines snaked down Gosnell Hall for a paper cup sample of liquid nitrogen ice cream, which festivalgoers could top with chocolate or strawberry sauce. “This is always popular,” said Trent Mochel, a third-year chemistry major from Warwick, R.I., as he stirred a big batch of the vanilla cream concoction in a metal bowl. Mochel said the exhibit was prepared to serve all 30,000 people expected to attend the festival. Also popular: The Theme Park Engineering 4.0 exhibit, which featured amusement park rides constructed from K’Nex pieces and added a virtual reality component this year. Visitors donned virtual reality headsets that immersed the “rider” in the sights and sounds of a rollercoaster ride—including the rises, drops, twists and turns. Visitors could opt for “mild” or “wild” rides. Inside the Clinical Health Sciences Center, ultrasound demonstrations showcased how this medical imaging technique peers inside the body without harmful radiation. Students in the diagnostic medical sonography program scanned each other and explained the anatomy shown on the monitors. Cadaver slices encased in plastic help students understand the spatial map of the human anatomy. “A lot of people don’t realize how close everything is in the body,” said Jodie Crowley, clinical coordinator in RIT’s diagnostic medical sonography program, as she pointed out arteries and organs to the Photinakis family. The Photinakis family came to RIT on April 27 from Washington, D.C., for an open house at NTID and stayed for Imagine RIT. Christina Photinakis, a junior in high school, is interested in health professions and was pleased to learn others with hearing loss are doing well in RIT’s ultrasound program. Crowley, a 1996 alumna of the program, worked in the profession for 10 years before she came back to RIT to teach. Inside the College of Science, visitors got a crash course in optics at the Seeing the Invisible exhibit. Lauren Taylor, a Ph.D. student in the Chester F. Carlson Center for Imaging Science and president of the SPEI/Optical Society of America Student Chapter, demonstrated Schlieren imaging, or streak imaging, using the flame from a lighter to show how changes in the air deflect light. “You can see heat rising, you can see air flow, because it is turbulent, it is perturbing the air. You can see different gases,” Taylor said, noting that changes in air density are too small to see with the human eye. 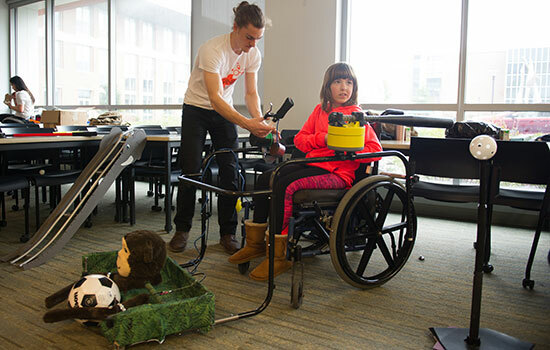 In the Kate Gleason College of Engineering, the Dazed and Confused exhibit invited people to step up to the life-size dummy wearing a yellow football helmet, take aim and give it wallop. High-tech sensors embedded into the helmet are part of a wireless concussion detection system built by RIT engineering students to be used by high-impact sports such as football, hockey, lacrosse and boxing. “This does not specifically diagnose concussions but will let coaches know that their players have been hit hard. We know that athletes don’t want to leave games even after big hits. They can get medical care sooner if needed with this information,” said Jimmy Cummings, a fifth-year biomedical engineering major from Westford, Mass. He and his classmates were part of a senior multidisciplinary student design team that built the system and app using wireless technology to gather data from the sensors. Students and festivalgoers got their 15 seconds of fame at an interactive lecture about livestreaming. 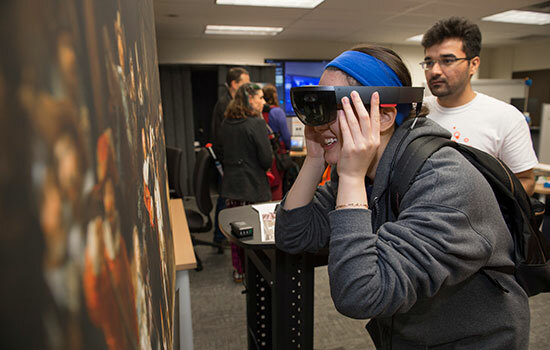 Functioning as both an exhibit and a one-credit course for RIT students, participants got an introduction to world of livestreaming, where tools, including Facebook Live, Periscope and Twitch, allow people to broadcast their content independently to gain a following and even make money. Plus, the whole thing was livestreamed. Students taking the course for credit will write a reflective paper on the experience. For festivalgoers, the homework is optional. The discussion and Q&A, taught by Mike Johansson, senior lecturer of communication, and Nicholas Lemieux ’13 (multidisciplinary studies), founder of a streaming company called Million—is now available to view online at twitch.tv/videos/255438630. In the Computer Zone, festivalgoers got to playtest a video game that mixes virtual reality (VR) with augmented reality (AR). 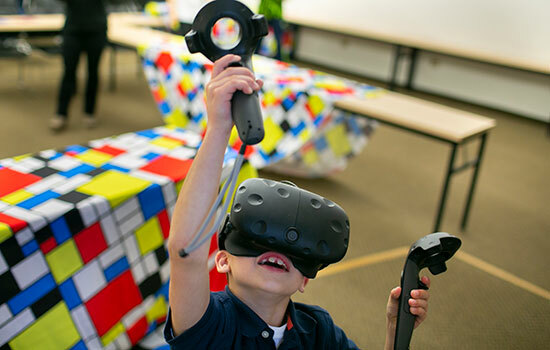 Created by a team of students as part of a class project, VRsus guARdian allows an AR player—using an iPad—to chase down a VR player who is trying to navigate a virtual space that maps to the actual physical play area. While the players are standing on different sides of the room, they are actually playing in the same game. Usually AR and VR are standalone games, but the team wanted to make something new that no one has ever experienced. The video game was created by game design and development majors and 3D digital design majors. After Imagine RIT, the team plans to submit and showcase the game to several other festivals. Ransom Quinn is using artificial intelligence to master writing. His writer-editor program, The Interactive Automated Author, took six months to build and program, but it might save writers who aspire to composing War & Peace some time developing their prose. The fifth-year computer engineering student from Fayetteville, N.C., said his program is built around two collaborative network parts, a writer and an editor. Inputting samples of published stories complete with language, rhythm, grammar and punctuations as a model, visitors composed their own sentences, and the system graded their work and even completed sentences, paragraphs and stories. Quinn’s goal is to make his system faster and eventually build an app for future authors. Exhibits in Saunders College of Business focused on critical thinking and making a difference in the world. Three exhibits, including a project where students created business plans for Haitian farmers to manufacture essential oils for export and another project that markets breadfruit as a source of nutrition, demonstrate the impact of global reach. One student team is working to develop commercialization opportunities for pumice roofing tiles in Nicaragua. According to Karina Penaloza Castro, a management graduate student from Ecuador, pumice—plentiful and sustainable in Nicaragua—can serve as a substitute for the more expensive clay or zinc roofing tiles that are currently used in Central America. In true multidisciplinary fashion, the business team paired up with a student engineering team that developed the production process for the tiles. The students say an added bonus is being able to study and understand different cultures. “We want to create jobs for the people of Nicaragua and create businesses that can be sustained by local families,” said Camila Mota Oliveira, a management graduate student from Brazil. The team also won an Imagine RIT applied critical thinking award for their work. Some exhibits wanted visitors to reflect on what’s good about life, as well as to inform them about ways to find help if needed. She says she wants to increase mental health awareness with her display. The College of Liberal Arts was represented with a display from research from courses about community, place and memory, funded by the National Endowment on the Humanities. “We had our students look broadly at Rochester but dig deeply into one neighborhood, Rochester’s Marketview Heights,” said Lisa Hermsen, professor and Caroline Werner Gannett endowed chair. Students studied the once-thriving garment industry and the formation of Bausch and Lomb as German and Italian immigrants settled into the neighborhood. “Rochester had major reformers, with Susan B. Anthony and Frederick Douglass who not only made an impact in the city, but helped shape national ideals,” said Richard Newman, a professor of history. Angelo Vitelli, a fourth-year industrial and systems engineering major from Cosenza, Italy, used the class to study this history of breweries in Rochester. “Before the prohibition, Rochester had 55 breweries, but only five after prohibition,” he said. And perhaps most importantly, the classes encouraged students to become engaged with community members who could be used as resources, such as Tony Apollonio, who has lived in the Marketview Heights neighborhood for more than 60 years. Inside the Golisano Institute for Sustainability, Nate Tiberio, a fourth-year electrical engineering student from Honeoye Falls, N.Y., showed off a senior multidisciplinary design project to design and build a strawberry hydroponic growing and monitoring system for Durgin Family Farms, located just south of the Henrietta campus. According to Jerry Affricot, a fourth-year computer engineering student from Amityville, N.Y., the hydroponic system features a convenient height for customers to pick their own strawberries (no more dirty knees) and an active web monitoring system to alert the grower to changes in the pH levels, temperature, oxygen concentration, conductivity and water level. “I’m glad they chose strawberries because they’re my favorite fruit,” said Amanda Dawson, 7, of Rochester, who attended the festival with her parents, Michael and Susan. “It’s amazing what you see here at Imagine RIT,” Susan Dawson said. The next Imagine RIT is set for April 27, 2019.